I love that in the Fall the Full Moons rise up in the sky as HUGE ( as in HUGE) orange balls. At night when I am driving and I spot that HUGE ( as in BIG) orange ball it always catches my eye and I try to follow it as much as I can. Sorry it just looks so big and close that I can almost touch it. Okay enough of that silliness. I have done some more reading on the moon phases and as I wrote above, the October Full Moon is also known as the Hunter’s Moon as the September Full Moon is known as the Harvest Moon. It is called the Hunter’s Moon since at this time of year the fields have been harvested and usually there is only the stubble in the fields. And at this time of year the deer and fox are still “fat” and good for hunting and more easily seen for hunting. And not I do hunt but that is why this moon is named for that reason~ just a bit of traditional lore. The Full Moon in general has been written about as affecting the tides more at this time of the month with high tides being higher. It is said to affect animals and planting and also lunacy and more car accidents happening at this time nd ER visits. But enough said about that. 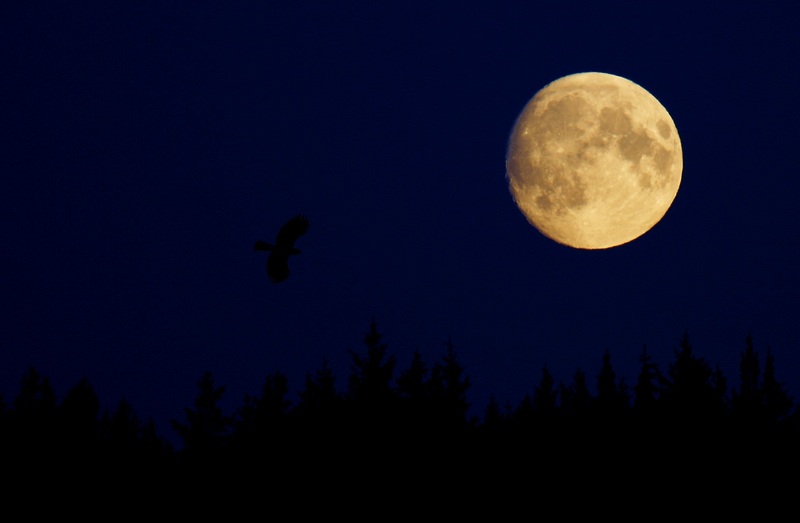 The Full Moon has reached its full power at this time of the lunar month – has reached its zenith and full potential. This is a time of strength and also a time of heightened feelings. There is powerful energy brewing and this may be the time to take some steps toward what you laid out during the new moon as your intentions for this month. A time for meditation and taking action on your goals. After these several days of the Full Moon, the Waning Moon starts its cycle. So, this is also a good time to let go of things, thoughts that are not working for you, are not aligned with what you want to manifest this month and keep holding you back. Now is the time to release them. You can symbolically write them down on a piece of paper ~ lighting the paper with a candle in an ash tray and letting the smoke symbolize them drifting away as you let them go. A potent time, concentrating on where you are at and your inner power and also releasing what is holding you back~ just like the ebb and flow of the tides of the ocean. Where do you see yourself at this time of the month? I heard the term hunters moon before…but I’m not clear what it called hunters moon…would you kindly explain? Hey Dennis ~ As said this is traditional lore- when the fields were harvested and all that was left in the fields was stubble. The deer and other animals had no place to hide and could be clearly seen. This made it perfect for hunting game. Why it was named that. Hope this makes sense.